Here are excerpts on deregulation from Scoring the Trump Economic Plan: Trade, Regulatory, and Energy Policy Impacts (PDF; 9/29/2016) | Peter Navarro and Wilbur Ross. In 2015, @FedRegister lists over 3,400 final rules issued. …@Heritage: The number and cost of federal regulations increased substantially in 2015, as regulators continued to tighten restrictions on American businesses and individuals. The addition of 43 new major rules last year increased annual regulatory costs by more than $22 billion, bringing the total annual costs of Obama Administration rules to an astonishing $100 billon-plus in just seven years. We assume the Trump plan seeks to reduce the current regulatory burden by a minimum of 10% or $200 billion annually. … Donald Trump’s strategy will trim a minimum of $200 billion from America’s annual regulatory burden. This is roughly one-tenth of the $2 trillion consensus estimate of that burden. This reduction in regulatory drag would add $200 billion of pre-tax profit to businesses annually. Taxing that additional profit at Trump’s 15% rate would yield $30 billion more in annual taxes. This would leave businesses with an additional $170 billion of post-tax earnings. Here are excerpts on employment from Scoring the Trump Economic Plan: Trade, Regulatory, and Energy Policy Impacts (PDF; 9/29/2016) | Peter Navarro and Wilbur Ross. Justin Pierce of @federalreserve staff and @YaleSOM’s Peter Schott attribute most of the decline in US manufacturing jobs from 2001 to 2007 to the China deal. David Autor of @MIT, David Dorn of @uzh_news_en, and Gordon Hanson of @UCSanDiego have described a “China trade shock” that has raised the unemployment rate, depressed wages and the labor participation rate, and reduced the lifetime income of workers in American manufacturing most “exposed” to the shock. … The structural problems driving the slow growth in the US economy over the last 15 years have primarily been the investment and net exports drivers in the GDP growth equation. … @EconomicPolicy estimates that there are more than 2.2 million workers “missing” from the accounting by the Bureau of Labor Statistics in the calculation of the unemployment rate. If these workers were actually counted, the US unemployment rate would be at 6.2%, significantly higher than the official rate of 4.9%. Increasing real GDP growth from 1.9% to 3.5% would put almost all of these missing workers back to work a year. Here are articles on trade. Excerpts are on our own. An enormous and pervasive trade distortion could be corrected through a border adjustment tax on imports from countries that use Value Added Taxes – i.e., nearly all countries. These levies in effect penalize U.S. goods seeking overseas customers and subsidize foreign goods destined for America. Some estimates judge that this policy discrepancy generates about half of the U.S. trade deficit. …and he would support the administration of Donald Trump in ensuring trade was a positive force for job creation. … Trump has described the Geneva-based trading club as a “disaster” and suggested he could pull the United States out of the WTO if the rules proved an obstacle to his plans to protect U.S. manufacturing. … Specifically, the panel found fault with the U.S. practices of determining dumping margins in certain cases of “targeted dumping,” in which foreign firms cut prices on goods aimed at specific U.S. regions, customer groups or time periods. … China is offering excessive support for the production of corn, rice and wheat, in the process denying American farmers the ability to compete fairly for exports. China… simply manipulates currency exchange rates to make its exports attractive and to keep imports expensive, thus perpetuating and increasing its trade surplus. … First it forces vehicle-making companies to locate their factories in China if they want to sell to the growing Chinese market. Then it forces them to “share” their proprietary technologies with Chinese competitors. Caterpillar already has 11 factories in China. It also has two Chinese competitors – Liugong and Sany – that are producing what one expert describes as “knockoffs” of Caterpillar models, and they are exporting them to the world. WTO rules permit China to place 30% tariffs on vehicles. WTO rules let China manipulate currency exchange rates in order to keep its trade out of balance. WTO rules let China loot western companies of their technologies. … His suggestions that his administration could impose 45% across-the-board tariffs on goods from China have drawn threats of retaliation by Chinese state media against U.S. soybeans and companies such as Boeing (+0.15%) and Apple (-0.51%). … “I’m of the belief that there is a lot of space between our current policy and an all-out trade war,” @ScottPaulAAM (@KeepitMadeinUSA) said, adding that he would like to see Trump be more proactive on enforcing existing trade rules. … Since President Ronald Reagan, Republican and Democratic administrations have been reluctant to confront countries that may be subsidizing or dumping exports, either because the evidence is unclear or because of a risk of damaging diplomatic or strategic relations. … The Obama Administration has been preparing to file a World Trade Organization case against China over claims that it subsidized aluminium exports. And the United States, Japan and the European Union already complain that Chinese government subsidies have produced a bloated domestic steel industry that they say dumps millions of tons of excess goods on world markets each year. When we examine the geographical incidents of it, Washington State is the worst affected state losing 5 percent of its jobs relative to baseline. But then there’s a broad swath of states that lose 4 to 5 percent of their jobs. 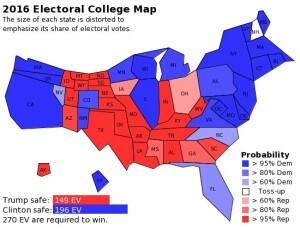 And these include a number of so-called battleground states. We have North Carolina in that group, Pennsylvania, Ohio, Wisconsin, and so on. … The worst affected counties happen to be two counties in California in Northern California which lose 7 percent of their jobs. Another one we examined is a kind of buy no American policy where the government of China tells its state-owned enterprises stop buying American business services. So that really affects software, financial services, and so on. A third possibility is an embargo on soybeans. US-China bilateral trade in soybeans is a quarter of the world market. And so, China just puts on an embargo. In that first one in the aircraft scenario, …the Seattle area, Seattle-Tacoma, Everett, Washington, very hard hit, Wichita, Kansas, hard hit, parts of Connecticut and Texas where Pratt & Whitney produces engines, hard hit. … Shutting down trade with Mexico and China would have ripple effects in ways that people don’t think about. pairment, claiming compensation because their legitimate expectations of trade benefits had been defeated by the Article XXI action.17 Or they might simply retaliate without waiting 18 months or more for the WTO Appellate Body to adjudicate their claim. tariff of upto 15 percent or quantitative restrictions, or a combination of the two, for up to 150 days, as a remedy, either on a nondiscriminatory basis or against one or more countries selected because of their large balance of payments surpluses. …highly doubtful that the courts… then invoke it against the same target country or countries for another 150 days. …unlike Section 232(b) of the 1962 Act, Section 122 tariffs can be imposed across the board without the need for a prior national security investigation. … At best, the target countries could bring a GATT Article XXIII Nullification or Impairment case or resort to self-help. Despite the limitation “During the time of war,” which appears in the opening language of Section 5(b)… no congressional declaration (pursuant to Article 1, Section 8 of the US Constitution) is required for the United States to engage in war. …trading partners and US firms would quickly fall into line. 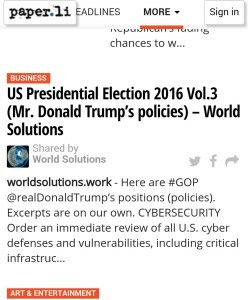 But if he… imposes the trade restrictions of the magnitudes threatened, foreign countries will soon retaliate. They will not patiently wait for US court proceedings or WTO litigation to vindicate their rights under national or international law.28 Enormous economic damage will ensue long before the legal battlefield is cleared. TYVM @BuisnessB "[WORLD] ISIS Scraps Plan to Invade Jordan Over Problematic Brand Name Change http://t.co/ofyiSfKfDS @israelidaily"
Here are articles on national security. Excerpts are on our own. A man…who even reportedly eavesdropped on calls between guests and staff at his Mar-a-lago hotel, would control the world’s most powerful surveillance capabilities. … NATO accepted the Bush administration’s request to assume leadership of the International Security Assistance Force (ISAF) in Afghanistan in August 2003. … Nearly 50 nations, including Azerbaijan, Finland and the United Arab Emirates, sent troops to Afghanistan in support of ISAF’s mission. … Brexit’s critics used to claim that quitting the EU would leave this country isolated on the world stage. But you can’t claim that when the President-elect of the most powerful country on Earth is in favour of it. … Gone is all the talk about Britain going “to the back of the queue” after Brexit, to be replaced by warm words about Trump’s desire for a spectacular relationship with the UK. Mrs May has a chance to create a strong relationship with Trump before other European leaders even start trying. … This isn’t about liking Trump or endorsing his views. It is simply being realistic: He is the next US President and Britain has to deal with him. After all, working with Trump is far less compromising than cooperating with the undemocratic Chinese government. … If the US starts backing away from its obligation to defend other Nato members from attack then Britain’s nuclear deterrent and military forces will become far more important than before to Europe’s security. … Russia’s military would have so many advantages in a regional conflict that the West might have to resort to using nuclear weapons to avert defeat. It might also have to attack targets inside Russian borders, which under Moscow’s current military doctrine could result in its own use of nuclear weapons. With only one working missile-warning satellite, Russia could easily misinterpret NATO moves. If Trump bolsters U.S. conventional forces while also scaling back commitments, that could slow the drift toward an uncontrollable nuclear exchange. … According to Kanat, the Obama administration emphasized that Daesh was a bigger threat to Turkey than the PYD/YPG and underestimated the significant threat terrorist groups posed to Turkey’s national security. … Trump also has not explicitly criticised Russia’s invasion of Ukraine and its annexation of Crimea, suggesting that he might be comfortable with returning to a Cold War-type unofficial agreement on spheres of influence for the two great powers. …his preference to refrain from criticising human rights violations in increasingly authoritarian regimes in the region and to keep the US out of local conflicts that only destabilise countries (such as Libya, Yemen, and Syria). … His main aim seems to be to resume some calm in war-torn lands in a manner that allows the US to withdraw its troops from them, even if this means maintaining regimes such as Assad’s and ceding big power influence there to Russia. … The royals’ longtime connections to America’s two family dynasties, the Bushes and the Clintons, were on the wrong side of history. … The Saudis are nervous about what they see as rising Islamophobia in America. … Riyadh would like to see more aggressive moves against Tehran. The United Nations-endorsed nuclear deal with Iran is not Riyadh’s priority; instead, the Saudis want international attention and sanctions focused on Iranian subversion. They will welcome calls for regime change in Tehran and efforts to de-legitimize the Islamic Republic. … (King) Salman will press the incoming administration to get more deeply involved in getting rid of Assad. The Saudis believe Damascus is the place to upset Iranian influence in the region. … Assad, not the Islamic State (IS), is the top priority for the kingdom. … Another attempt at a cease-fire collapsed this week. A sudden crisis in the war could be an early test for the new US administration in February 2017. … @RepMikePompeo has been one of the leading critics of last year’s deal with Iran that traded sanctions relief for a nuclear rollback, aligning him with much of the centrist and right-wing pro-Israel communities. … Flynn reportedly has alarmed intelligence officials who have blamed cyberattacks on Russia. Flynn has been paid for a speech in Moscow and attended an official dinner with Russian President Vladimir Putin. The closeness of a national security adviser to a regime that has joined Iran in a loose military alliance with the Assad rule in Syria is sure to rattle some in Israel’s security establishment. … Flynn’s consulting firm has also done work for Turkish clients. … Education Minister Naftali Bennett, head of the right-wing, pro-settler Jewish Home party, said that Trump’s win was also a chance to end of any possibility of a Palestinian state. … Egypt is in talks to allow Russia use of military bases across the country, including an air base on the Mediterranean coast close to the border with Libya, Russian media reported last month. Can Trump fix this in the first term? …Libya would require not just massive diplomatic heavy-lifting, but also the development of a powerful national security force. …from… assurances to Iran on the tightening of the U.S. visa waiver program; to… “delayed and weak” response to Iran’s ballistic missile launches; to secret “side deals” between Iran and the U.N. nuclear watchdog; to the administration’s transfer of $1.7 billion in cash to Iran. Last January… rejected claims that it amounted to a “ransom,” saying that the money, plus another $1.3 billion in cash paid later, was settlement of a long-outstanding Iranian legal claim. …political complacency could turn the region into a hotbed for al-Qaeda and Islamic State (ISIS) offshoots and potentially waste more than $600 billion in U.S. taxpayer dollars spent to rebuild Afghanistan. … According to a recent report published by the Special Inspector General for Afghanistan Reconstruction (SIGAR), “approximately 63.4 percent of the country’s districts are under Afghan government control or influence as of August 28, 2016, a decrease from the 65.6 percent reported as of May 28, 2016.” However, according to General John Nicholson, commander of the Resolute Support mission in Afghanistan, those districts under Afghan government control contain the majority of the Afghan population, roughly 70 percent. … The new administration has the ability to capitalize on some of Afghanistan’s progress by maintaining support to the Afghan military, engaging key stakeholders, and spearheading Afghanistan’s international efforts to cultivate shared economic interests with its neighbors, ensuring the landlocked nation does not revert back into a cycle of warlordism, instability and a safe haven for terrorist groups. Now is not the time to abandon Afghanistan. …the DNI was never a solution to the 9/11 attacks. It’s a law… part of the Intelligence Reform and Terrorism Prevention Act; …they would have to pass a new law unwrapping all the things in that law. Specifically with the Defense Department… He proposes that the Army should be sustained at 540,000 troops. Forbes: … Because one of the things Mr. Trump realizes is you don’t build your national defense on what you think the other players’ intent might be. Intent can change in 48 hours. You build it on capacity and capability. Sessions: … The world needs to know that we are not going to be a second-rate military power. You are not going to surpass us. I think that kind of strength allows us to do a better job of maintaining peace in the world. Here are articles on R&D. Excerpts are on our own. …@SciDebate… Instead of promising to install a half-billion new solar panels, as Clinton promised to do, Trump offered the kind of perspective found in the Copenhagen Consensus, a group of prominent economists who have concluded that other problems are far more pressing than climate change. … Pharmaceutical companies were some of the biggest spenders on R&D in 2012, running up a $48.1 billion tab…@NSF… The information industry — including publishing, telecommunications and data processing — shelled out $46.8 billion, while transportation-equipment makers spent about $42.3 billion. Loretta Mester, president of @ClevelandFed…@business_econ… she’s “not a structural-stagnation kind of person,” citing the theory which argues the economy is trapped in a prolonged period of sub-par growth. Here are articles on hospitality industry. Excerpts are on our own. …@WTTC and @USTravel… the travel industry will remain a priority globally and also in Washington’s corridors of political power. …@CarolineBremner… Travel and tourism is directly impacted by government policies on trade and immigration. …it will stimulate increased demand for domestic tourism, as Americans will have less discretionary income as the U.S. economy decelerates, making the staycation a more affordable travel option to many. …there could also be opportunities for home-grown American brands, and those whose marketing message registers with Trump’s rhetoric and is centered on nostalgia, localism and heritage. …a Trump presidency would work toward improving the travel industry’s infrastructure, including the nation’s airports. 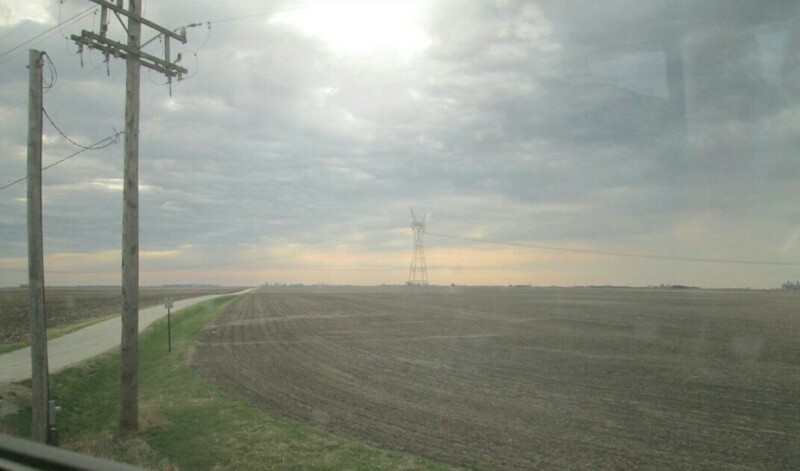 Here are articles on infrastructure. Excerpts are on our own. … It’s a great investment, especially in an age of low interest rates: Putting just $18 billion a year into roads, bridges, and waterways could create a $29 billion jump in GPD and more than 200,000 jobs in the first year, says @joshbivens_DC, research and policy director of @EconomicPolicy. The idea is to trigger $1 trillion in private sector infrastructure spending with $140 billion in tax credits for the companies willing to do the work. “Getting the private sector involved is terribly important,” says Brian Pallasch, managing director at @ASCETweets… …the US is among the most attractive nations for those looking to invest in infrastructure, according to THIRD GLOBAL INFRASTRUCTURE INVESTMENT INDEX 2016: BRIDGING THE INVESTMENT GAP | @ArcadisGlobal. …@edwardalden, a senior fellow with ‏@CFR_org. Indeed: A June survey found 71 percent of Southern California drivers would pay up to $20 per commute if they could drive a traffic-free, new expressway. … From 2016 to 2025, each household will lose $3,400 each year in disposable income due to infrastructure deficiencies; and if not addressed, the loss will grow to an average of $5,100 annually from 2026 to 2040, resulting in cumulative losses up to almost $34,000 per household from 2016 to 2025 and almost $111,000 from 2016 to 2040 (all dollars in 2015 value). Over time, these impacts will also affect businesses’ ability to provide well-paying jobs, further reducing incomes. If this investment gap is not addressed throughout the nation’s infrastructure sectors by 2025, the economy is expected to lose almost $4 trillion in GDP, resulting in a loss of 2.5 million jobs in 2025. …Mrinalini Ingram, vice president of smart communities at @verizon… Verizon networking technology embedded in LED street lights and blue-light kiosks where pedestrians in danger can call police. …Richard Lukas, director of federal grants and program development at @tpl_org, was worrying about the fate of federal grants used to fund a riverside park in Newark, N.J., a three-mile park along an abandoned rail line in Chicago, and a trail and bike system in Cleveland. … While the American Society of Civil Engineers has projected a $1.44tn funding investment gap between 2016 and 2025 on infrastructure, consultancy McKinsey estimates that $57tn is needed globally by 2030 to finance infrastructure projects. If Mr Trump carries through his plan to spend “double” what Mrs Clinton had promised on infrastructure, the US construction industry should see an uplift of around 30 per cent, says Mr Simon Clinch (@InvescoUS). Even so, he warns that just as infrastructure is a long-term investment, the benefits may not show up on the balance sheets of construction companies for quite some time. Here are articles on foreign policy. Excerpts are on our own. …would move the U.S. Embassy from Tel Aviv to the contested city of Jerusalem, breaking with a half-century of U.S. policy that says the future of Jerusalem must be decided in talks between Israel and the Palestinians. Legally, a country can withdraw three years after the agreement goes into force, and then it must wait a year for the withdrawal to go into effect. That means a formal withdrawal by the U.S. could not happen before 2020, at the end of Trump’s four-year term. … But such a provocative step could invite retaliation in the form of import duties on U.S. goods. The result would be a global trade war that could trigger a worldwide recession. … The country is undergoing an historic economic transition, its growth has slowed and it still relies heavily on exports, so a trade spat with one of its most important trading partners could have widespread consequences. … If the United States drops sanctions, other European countries could follow, breaking the 28-member EU’s tenuous consensus on sanctions. … Trump will find it difficult to roll back a trade agreement that has been in place so long and includes protections against unilateral withdrawal, but could slowly kill the deal by repudiating elements of it and enforcing trade restrictions. … Trump promises to slap to big tariffs on Chinese imports, which would raise the cost of consumer goods coming in to the U.S. China could respond by shutting off market access and raising tariffs on imports from the U.S., which could hurt American manufacturing, financial services and even agricultural sectors. … Analyst warn that Trump needs to go slow on his trade agenda, otherwise he risks retaliation from some of the world’s most important trade partners. …the ones to pay attention to the details of Trump’s foreign policy and sound the alarm if it trends in dangerous directions. Even with Republican control of Congress, these voices may be heard, especially if the divide between Trump and Republican foreign policy elites persists. …it is important to resist Putin’s game-changing challenge to the post-1945 liberal order’s prohibition on the use of force by states to seize territory from their neighbors. At the same time, Trump is correct to avoid the complete isolation of a country with which we have overlapping interests when it comes to nuclear security, non-proliferation, anti-terrorism, the Arctic, and regional issues like Iran and Afghanistan. Financial and energy sanctions are necessary for deterrence; but we also have genuine interests that are best advanced by dealing with Russia. No one would gain from a new Cold War. … The risk in the short term is that Putin, who has no respect for western strategic decision-making, may exploit the American interregnum and challenge Nato over Ukraine or the Baltics. He is certainly going to continue his monstrous bombing campaign in Syria. … Overall, Trump may be the bigger militarist. Though he has attacked Clinton for backing the invasion of Iraq and the bloody counter-insurgency war that followed, archived interviews have indicated that Trump did not actually oppose the war as he’s claimed. Same with U.S. intervention in Libya. Indeed, in both cases, Trump called for an even greater use of force, including seizure of oil fields for U.S. economic benefit. He also agrees with Clinton to militarily intervene in Syria to create “safe zones” for refugees and to escalate U.S. bombing against ISIS. … Trump also claims “our nuclear weapons arsenal”—on which Obama plans to spend nearly $1 trillion over the next thirty years—“has been allowed to atrophy and is desperately in need of modernization and renewal.” He has criticized Obama’s cancellation of the missile defense program, despite extraordinary cost and highly dubious efficacy. He pledges to dramatically increase military spending. … This strategy of liberal hegemony sees the U.S. as a force for the spread of international institutions, free-market economics, human rights, and especially democracy that goes well beyond U.S. national security needs. This view is good for the U.S.’s self-image, but it is fundamentally flawed, Walt said. In his view, it increases the area the U.S. must defend, but does not increase the means to defend it, and has led to more failure than success in preventing the spread of nuclear weapons. … Rather than take on burdens across the world in the name of liberal values, this strategy would use local powers to prevent the rise of a hegemon in the key areas mentioned, using American military power only when necessary to prevent a country from having too much dominance in the region, he said. … @EileenBabbitt, a professor of practice of international conflict analysis and resolution and director of ‏@FletcherSchool’s Institute for Human Security, cautioned that the zero-sum, hard-bargaining style that Trump has employed in business may escalate tensions on the international stage, where “escalation leads to potentially devastating consequences.” For example, she said, if Trump pulls the U.S. out of the Iran deal, Iran could be free to develop its nuclear capacity, and the likelihood of a pre-emptive strike from Israel, if it feels threatened, would increase. “I hope calmer heads prevail,” she said. (professor of international law Michael) Glennon… said that U.S. democracy is in crisis because of “pervasive civic ignorance.” …argued that Americans who do not support Trump’s policies should “resist with empathy” by organizing, lobbying and filing lawsuits. …important for Trump to assemble a team made up of personalities who are able to work well together. Here are articles on tax (and budget/economy). Excerpts are on our own. @StephenCalk… the loss of the exemption is partially offset by other changes in Trump’s plan. … there will be big tax cuts for middle-income families. …a family earning $50,000 a year… child-care costs are $7,000 or $8,000 a year. …going to save 35 percent on their net tax bracket. @lilybatch… calculation is misleading because it focuses on tax rate reduction rather than a family’s after-tax income — in other words, how much money they have in their pocket after taxes. …limited to manufacturers, and those who elect expensing will lose the deductibility of corporate interest expense. • Collapse the current seven tax brackets, which range from 10 to 39.6 percent, into three brackets of 10, 20, and 25 percent. • Increase the standard deduction to $25,000 for single filers and $50,000 for joint filers in 2015, indexed for inflation thereafter. • Tax dividends and capital gains at a maximum rate of 20 percent. • Repeal federal estate and gift taxes. • Reduce the corporate tax rate to 15 percent. • Limit the top individual income tax rate on pass-through businesses such as partnerships to no more than 15 percent. • Repeal most tax breaks for businesses. • Repeal the corporate alternative minimum tax. • Tax future profits of foreign subsidiaries of US companies each year as the profits are earned. First… Think of it as the tax version of QE. But consumption has fallen, and newly subsidized businesses would still need customers in order for investing to make sense. Second… the system as a whole is not redistributive. … it would not put a lot more money in the hands of people with a high marginal propensity to consume. … The House Republicans have proposed the destination-based cash flow tax would work like a subtraction method VAT. It would be a cash flow tax because capital equipment expenditures could be immediately deducted in full. Intellectual property, research and wages costs would also be fully deductible. … likely to be the starting point for Trump business tax cuts. … The trouble with this plan is that it isn’t a VAT, and it wouldn’t satisfy the WTO trade agreements the United States signed. … Exporters could deduct domestic wages and importers couldn’t deduct foreign wages. … There are theorists who think that Congress might deliberately set up a WTO violation in order to be told to adopt a VAT instead. … Seven hundred US companies employ more than 100,000 people in Ireland, according to an @AmericanChamber report. @danobrien20 at @iiea also warns that Trump’s plan could “deteriorate in a trade war,” as “the US and Europe already have very deep disagreements” on issues of trade. @TaxPolicyCenter found smaller growth effects for the Trump plan than it found for @TaxFoundation. It estimates that the Trump plan would increase aggregate demand “by about 1.7 percent in 2017, by 1 percent in 2018, and by smaller amounts in later years.” It also reports a range of growth estimates under varying assumptions. After less than 10 years, @TaxPolicyCenter estimates that Trump’s tax cuts would reduce the size of the economy. @TaxPolicyCenter sees short-term growth resulting from the Trump tax plan because it increases after-tax incomes for most households, which they would likely spend, and because the expensing provisions would increase business investment. Here are articles on energy. Excerpts are on our own. Trump also is targeting recent Obama administration efforts to reduce air and water pollution that have been opposed by Republicans and industries that profit from the extraction and burning of fossil fuels, including a rule to protect small streams and wetlands and ozone regulations designed to cut down on smog. …there is one area where Trump is likely to have an immediate impact. That is in the midstream oil and gas business. Midstream businesses are those that move oil and gas from the site of production to processing plants, storage facilities, and end customers. Midstream consists largely of the oil and gas pipelines that crisscross underneath North America. Trump has emphasized the pressing need for infrastructure investments, and modernizing the nation’s power grid to accommodate electricity generated at homes and businesses (“distributed energy”)… the Trump administration should refrain from the federal regulatory micromanagement that might hinder them. Repeal can occur through a voluntary remand to the D.C. Circuit Court or the issuance of new rules. …would involve congressional action precluding the regulation of CO2 via the Clean Air Act by redefining what constitutes a pollutant. …could actually be bearish for oil prices. … Any policy restraining those new entrants and prolonging the life of existing power plants will boost utilities’ bottom lines. Here are articles on deregulation. Excerpts are on our own. Between the end of last year and the end of 2007, regulatory costs rose by more than 100% –or $35.5 billion– for ‏@BankofAmerica, @Citi, @GoldmanSachs, ‏@jpmorgan @Chase, ‏@MorganStanley and ‏@WellsFargo, according to data from policy-analysis firm Federal Financial Analytics Inc (@KarenPetrou). … The best interpretation is that it’s an awkward outreach to the disappointed “progressive” supporters of Elizabeth Warren and Bernie Sanders. The worst is that it calls into question whether Donald Trump really supports financial deregulation. … It was far less expensive for a firm in need of credit to sell bonds, notes or commercial paper to investors than negotiate complex financing arrangements with a bank. … One can’t believe in the reinstatement of Glass-Steagall and still believe in the repeal or significant modification of Dodd-Frank. It’s like saying free markets work, but price controls can help. – Tightening of derivatives regulations. – Changes to securitization regulations. …aimed at increasing transparency and trying to incentivize the firms that put together the securitizations to care about the quality of their securitizations. This meshes with reforms in other areas such as regulation of the rating agencies and increases in capital standards for securitizations under Basel III. …restoration of faith in the securitization market could ultimately reduce costs for banks by allowing them to resume the more active use of those markets. Non-bank financial institutions are shown as more affected, since some of them have made very heavy use of securitizations in the past. – Enhanced consumer protection regulations. Commercial banks in the United States are likely to be considerably affected over time by the newly established @CFPB. … The industry clearly views the CFPB as a major threat to profitability… Investment banks should be less affected since they sell fewer retail products, most of which would remain under @SEC_News supervision anyway. Many non-bank financial institutions…for the first time…the largest impact. – Expansion of the regulatory perimeter. – Higher taxes or fees facing financial institutions. – Tougher regulation of credit rating agencies. The Dodd-Frank Act encourages greater SEC oversight of the rating agencies, requires more transparency, and raises their legal liabilities. …unbiased and accurate ratings. – Structural changes to banks and activity limits. – Changes in regulation of compensation and governance. 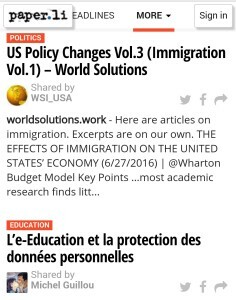 Here are articles on immigration. Excerpts are on our own. …most academic research finds little long run effect on Americans’ wages. …immigration leads to more innovation, a better educated workforce…and higher overall economic productivity. Economists generally agree that the effects of immigration on the U.S. economy are broadly positive. …immigration may actually have significant long-term benefits for the native-born, pushing them into higher-paying occupations and raising the overall pace of innovation and productivity growth. …a net positive return on the investment over the long term. … There is little evidence that immigration significantly affects the overall employment levels of native-born workers. …there may be positive wage effects for some subgroups of native-born workers, and other benefits to the economy more broadly. … However, as adults, the children of immigrants (the second generation) are among the strongest economic and fiscal contributors in the U.S. population, contributing more in taxes than either their parents or the rest of the native-born population. … Beginning on October 1, 1994, the law provided for a new stream of immigrants, known as “diversity” immigrants. … These reports have found that of the 20 companies that received the most H-1B visas in 2014, for example, 13 were global outsourcing firms. The top 20 companies received about 40 percent of the visas, while more than 10,000 other firms received far fewer visas. … In FY 2014, the EB-5 category reached its annual cap of approximately 10,000 for the first time. USCIS currently has a backlog of more than 20,000 EB-5 petitions awaiting adjudication. … The critical lesson from the 1990 Act and from both the important milestone immigration laws that preceded it — the Immigration Act of 1965 and IRCA in 1986 — is that they were achieved in a culture of greater political trust and bipartisanship than exists today, even though there were strong policy disagreements and divided government. … The estimated 11 million people living in the United States without documentation are here either because they entered the country illegally or overstayed their visas. … Trump has said they have only one way to gain legal status: leave and return with a visa, something that could require years of waiting. Here are two articles on employment. Excerpts are on our own. @Alan_Krueger (@princetonecon): … By most measures — including the unemployment rate, average work week, real average hourly earnings — the labor market is performing about where it was during the last recovery. The unemployment rate is slightly below where it was in the average month in the last business cycle expansion (2001-07). … The 2.5 percent rise in nominal hourly wages in the last year suggests that the labor market is getting close to full employment. … the passage of Dodd-Frank Wall Street Reform Act and more vigilant financial regulatory enforcement is likely to reduce the odds of another financial crisis in the near term. Ed Lazear (@StanfordBiz):… although we have made significant progress, the labor market has not yet recovered. … job creation… slightly over 200,000 per month… too fast to be consistent with full recovery. When we are in recovery equilibrium, job growth should just keep up with population growth. To keep pace with a growing population, about 140,000 per month are required. …we are still gaining jobs on net, which means we are still recovering, not fully recovered. … When the labor market is improving rather than stable, it is not fully back to normal. That wages have not grown is no surprise. A necessary condition for wage growth in the U.S. has been productivity growth. …the weak recovery is best explained by low investment. … Increased taxes on capital, additional regulation, government suits and fines against companies especially in the financial sector have not encouraged capital formation. … I am not confident that Dodd-Frank has done much to make the economy more secure. Instead, I believe it treated the symptom rather than the cause. Here are three articles on healthcare. The election of Donald J. Trump and the re-election of a Republican-controlled House and Senate will usher in big #policychanges. Excerpts are on our own. …five states — Alaska, Alabama, North Carolina, Oklahoma, and Wyoming — that only have one insurance plan signed up to sell in 2017. … currently one county in Arizona that has no health plans signed up to sell. 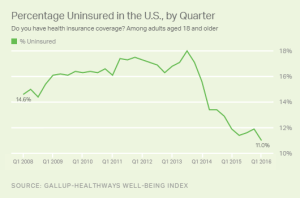 …individual mandate, which they found to be too weak and poorly enforced, leading to lower-than-expected enrollment among healthy, young adults. …right now they’re about 28 percent of the marketplace population. …Uwe Reinhardt at @Princeton … points out that it’s not the case that partnerships with private insurers can’t work to expand coverage. There are other countries like Germany and Switzerland that have, for decades now, achieved universal coverage working with private plans. … They mandated the benefits each insurer covers and how much each medical service costs. They also set up much stronger laws to force consumers to buy coverage. … @Centene… came into Obamacare knowing how to target those people, as @stltoday reporter @samanthann …narrowly focusing on low-income individuals who have lost their Medicaid eligibility and need to find a private health insurance plan. Here are articles on speeches after the 2016 election. Excerpts of the speeches are on our own. … I’ve just received a call from Secretary Clinton. She congratulated us. It’s about us. On our victory, and I congratulated her and her family on a very, very hard-fought campaign. I mean, she fought very hard. Hillary has worked very long and very hard over a long period of time, and we owe her a major debt of gratitude for her service to our country. I mean that very sincerely. Now it is time for America to bind the wounds of division, have to get together. … I pledge to every citizen of our land that I will be president for all of Americans, and this is so important to me. For those who have chosen not to support me in the past, of which there were a few people, I’m reaching out to you for your guidance and your help so that we can work together and unify our great country. As I’ve said from the beginning, ours was not a campaign but rather an incredible and great movement, made up of millions of hard-working men and women who love their country and want a better, brighter future for themselves and for their family. It is a movement comprised of Americans from all races, religions, backgrounds, and beliefs, who want and expect our government to serve the people, and serve the people it will. … Every single American will have the opportunity to realize his or her fullest potential. The forgotten men and women of our country will be forgotten no longer. We are going to fix our inner cities and rebuild our highways, bridges, tunnels, airports, schools, hospitals. … We have a great economic plan. We will double our growth and have the strongest economy anywhere in the world. … I want to tell the world community that while we will always put America’s interests first, we will deal fairly with everyone, with everyone. All people and all other nations. We will seek common ground, not hostility; partnership, not conflict. … Great brothers, sisters, great, unbelievable parents. To Melania and Don and Ivanka and Eric and Tiffany and Barron, I love you and I thank you, and especially for putting up with all of those hours. … And Kellyanne and Chris and Rudy and Steve and David. We have got tremendously talented people up here, and I want to tell you it’s been very, very special. I want to give a very special thanks to our former mayor, Rudy Giuliani. He’s unbelievable. … Gov. Chris Christie, folks, was unbelievable. Thank you, Chris. The first man, first senator, first major, major politician — let me tell you, he is highly respected in Washington because he is as smart as you get. Sen. Jeff Sessions. Where is Jeff? A great man. … I got to know him as a competitor because he was one of the folks that was negotiating to go against those Democrats, Dr. Ben Carson. … By the way, Mike Huckabee is here someplace, and he is fantastic. Mike and his familiar bring Sarah, thank you very much. Gen. Mike Flynn. Where is Mike? And Gen. Kellogg. … We have 22 Congressional Medal of Honor people. … I said, they can’t call you a superstar, Reince, unless we win it. Like Secretariat. … We’re going to get to work immediately for the American people, and we’re going to be doing a job that hopefully you will be so proud of your president. You will be so proud. Again, it’s my honor. It’s an amazing evening. It’s been an amazing two-year period, and I love this country. … Thank you very much. Thank you to Mike Pence. One day left. Here are articles mainly on polls up to early morning 11/7 EST. With just days to go, Triumph has some shocking new revelations on Donald J. Trump and Hillary Clinton.